I don’t usually follow football, but I do live in the Indianapolis area and like most Hoosiers I was caught up in all of the hoopla leading to last year’s Super Bowl victory. Even still, I probably would not have given this photograph so much as a second look, let alone a second thought, had it shown up in the Indianapolis Star or one of the smaller suburban newspapers. After all, Peyton Manning is a hometown hero and regularly celebrated by the local media. But where I came across it was in the New York Times “Pictures of the Day” slide show for August 17th, nestled in with photographs of the tragic (the Peruvian earthquake, the Utah mine disaster), the mundane (a long time congressional leader announcing his retirement, political and religious celebrations), and the silly (the Dutch Office Chair Racing Championship). What makes this photograph notable is how truly ordinary it is: a revered sports figure attending to his doting fans. Even the irony of “real” warriors seeking the attention of a professional “weekend” warrior seems to slip past our notice with a wink and a nod, as just another day at the office. 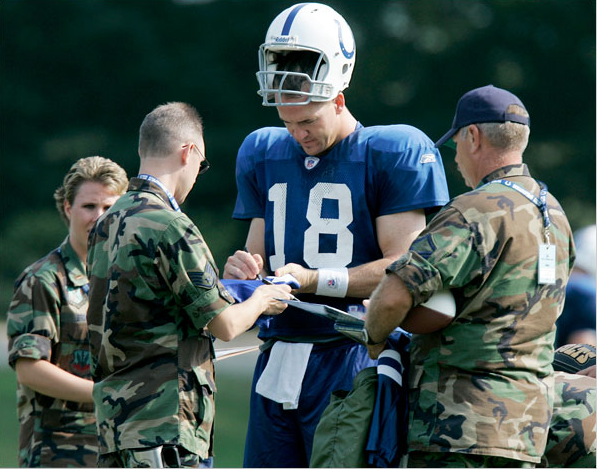 As the caption reads, “Taking a break from preseason workouts, Peyton Manning, quarterback for the Indianapolis Colts, signed autographs for members of the 181st Tactical Fighter Wing visiting training camp in Terre Haute, Indiana.” And therein lies the problem, for these are most definitely not normal times. Like it or not, we are entrenched in a foreign war that over a period of four years has taken the lives of 3,700 U.S. troops and at least 50,000 Iraqis. And yet here we have a “picture of the day” in the “paper of record” that shows absolutely nothing out of the ordinary—for civilians and the military alike. Indeed, in an array of fourteen photographs of “the day,” this is the only one to portray the U.S. military in any fashion whatsoever. The image of Peyton Manning signing autographs for members of the 181st Tactical Fighter Wing is telling in this regard. The faces of the autograph seekers are turned from the camera or obscured from view, their identities reduced to the anonymity of the uniform they share and the souvenirs that they carry; the only identifiable visage belongs to the successful warrior (“winning, is” after all “the only thing”), girded for battle. Manning towers over his suitors like a Titan. They seem to approach him tentatively, respectfully; they are thus subordinate not only in stature, but in attitude and gesture (as is due the “conquering hero”). Winning the Super Bowl is no small thing, to be sure, and obeisance to sport celebrities is a regular feature of late modern consumerist culture, but when military figures are visualized as supplicants to a civilian athlete during a time of war, our eyebrows should raise just a bit. But focusing too much on how the photograph normalizes the current situation in Iraq risks looking past a separate, albeit related, concern. For the image also visualizes—and in the process normalizes—conventional beliefs and attitudes about the constitutive identity between the military and contemporary sport culture. The above quotation from Vince Lombardi is posted at a website for Sandhurst, the U.S. Military Academy Prep School. And like the photograph, it is altogether routine, a comparison that not only recalls the romantic mythos of battle and warfare of a bygone era, but is part and parcel of our contemporary vocabulary for talking about sports: a season is a “campaign”; coaches, quarterbacks, and point guards are “generals”; contests are won or lost “in the trenches”; the field of play is a “war zone”; and on and on. And then too there is this: Since July 2005 the U.S. Army and the U.S. Marines have spent a combined total of 12.5 million dollars in sports related television recruitment advertising aimed at the 17-24 demographic, with the vast majority of it going to ESPN. In reading an article on the IU/Kentucky basketball game in the Indiana Daily Student, I read IU Coach Tom Crean quoted as saying, “I use the expression ‘the bullets were flying’ a lot”. The quote goes on to state that Crean mentioned that “the machine guns were firing, the tanks were out”. I watched the Kentucky game closely, and saw a Kentucky basketball team which beat our Hoosiers, this year, with their superior athleticism and skill. I hope that in the future our beloved Hoosier Basketball Team can rebound from the disastor created by Rick Greenspan (whose legacy can only be that he ruined IU Basketball for a period of time). And, please, Coach Crean, as your apparent enthusiasm and Coaching skill leads us back to prominence, eliminate the metaphors of war. Only Veterans who have survived under fire have earned the right to tell the rest of us of the horror of war. Basketball is a Game. A wonderful and joyous Team Sport which can be used to inspire as well as to entertain us with the thrill of watching superb athletes compete. Basketball is a mental and physical battle, but, thankfully, has no bullets, no tanks, No War. I enjoyed reading North Dallas Forth, by Peter Gent, which goes into Football and the metaphor of war. It’s a fun read!